An expert in grass ecology and champion of sustainable design. 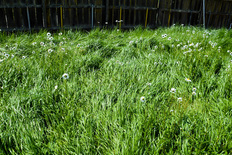 John Greenlee has made meadows all around the world. His designs are featured at such notable public spaces as the San Diego Zoo, Disney's Animal Kingdom in Florida, and the Getty Center in Los Angeles. John Greenlee has also created beautiful meadows gardens in private residences all over California, the U.S., including Hawaii, Morocco, the United Kingdom and Saudi Arabia. Many of his most recent meadow creations can be found adding to the beauty of Napa and Sonoma counties. Greenlee and Associates is happy to utilize our extensive resources for meadow design, consultations, and plant sourcing. The Greenlee meadow program, formerly available through Greenlee Nursery in Chino, recently moved to Northern California. Nonetheless, we are excited to provide you with our professional services in sourcing any plant material for your next meadow garden creation. NEW WEBSITE AND ONLINE STORE COMING SOON! The new allstar of the Greenlee collection! Click for more information.